Join us for the 20th Erlang User Conference! Grab your ticket now. Making Hard Stuff Easy with Functional Programming. Fuse - Let it Crash & Handle with Grace! Building a Cloud with Erlang and SmartOS - How Hard Could it Possibly Be? The Parallelism and Concurrency Landscape: Where does Erlang Fit? Welcome to the 2nd Day of the EUC! Access to the tutorials is free for all delegates to the Erlang User Conference, but registration is required. You are welcome to register for as many tutorials as you like, but unless you can clone yourself make sure they do not overlap. We have a limited number of places and the seats will be allocated on the first come, first served basis. The tutorials are hands-on, so please bring your laptops. The Lisp Flavoured Erlang Community is pleased to announce that we will be holding our first ever community design summit in Stockholm, Sweden during the Erlang User Conference. Our goals are to not only share plans, but to discover what you want from LFE and how do you want to use it. This is an opportunity for us to work together, explore interesting problems to solve, build community consensus around language goals, and identify efforts around which each of us are interested in collaborating with others in the course of subsequent months. We have one more room available on the 9th of June from 6 to 7 pm. All delegates and speakers interested in organising a meetup or a user group during this interval are invited to submit their proposals here. The Erlang User Conference 2014 will be held in the exciting, spacious building of the Münchenbryggeriet. 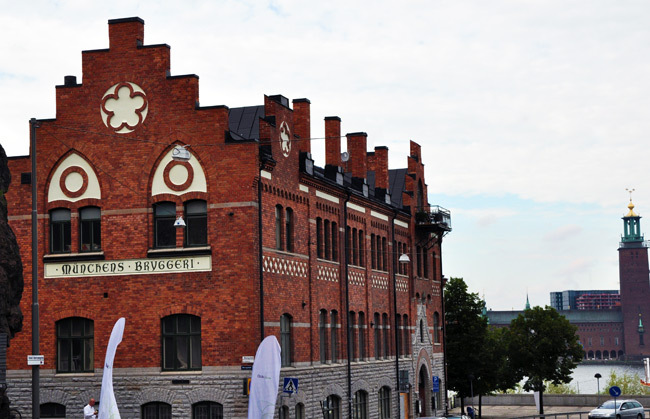 This old building has been a characteristic part of the Stockholm skyline for over 100 years and until 1971 was used as a brewery. Since then, however, the venue has undergone fantastic refits and has seen the building transformed from the historic industrial space of the past into the bright and modern conferencing venue that you see today – marrying the old and the new to create a truly unique experience. The nearest metro is Kista T-bana‎. The walking directions from Kista T-bana to the venue are here. The nearest train station is Helenelund. The walking directions from Helenelund train station to the venue are here. There are four airports within range of Stockholm. Arlanda Express. Leaves every 15 minutes, takes about 25 minutes, costs 260 SEK (130 if you're under 26!) one-way. Comfortable but expensive. Flygbuss. Leaves every 10 or 15 minutes, takes about 45 minutes, costs 105 SEK one-way. Taxi. Won't save you any time, but it will cost more. The taxi company "Taxi Stockholm" has fixed prices to and from the airport, but make sure you ask for "fixed price". The fixed price for Arlanda to Stockholm City is 520 SEK + surcharges. Bromma Airport is used mainly for domestic flights. There's a Flygbuss (20 minutes, 75 SEK one-way) and also normal public transport, e.g. you can take bus 152 to the station. Skavsta and Västerås are two "budget" airports used by Ryanair, e.g. there are several flights to and from London (Stansted/Luton) every day. Take the Flygbuss to town, it's the only sensible option. They leave whenever a flight arrives. Stockholm is not a good place to get around by car. Public transport is excellent, though not cheap. There's a great webpage with timetables, maps and information.